Queen Honeybees: A honeybee queen could live for 3 to 4 years, as long as she is free from disease. This is much longer than bumblebee queens or the solitary bee species. However, a queen that produces few eggs may not be favored by the colony. In such a case, a new queen will be produced, and the old queen replaced. This is called supersedure. In some beekeeping practices, the queen is replaced by the beekeeper after one or two years. Workers: In contrast, workers raised during the spring or summer months may live for only 6 or 7 weeks. 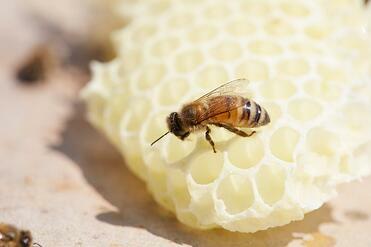 Their lives are especially busy, with lots of hungry larvae to feed and honeycomb to produce. This is when the colony is at its most productive—with workers busy collecting nectar and pollen for feeding the colony. Workers raised in the autumn have no brood to care for, since the queen stops producing eggs. These workers, together with the queen, comprise the remains of the colony for the year (part of the colony may have left in a swarm, in order to form a new colony elsewhere), and they must huddle together around the queen in order to keep warm during the winter, ready to emerge the following year to begin foraging again in the early spring. At most they live 4 to 6 months. Drones: Drones live for up to 4 months, though some survive for just a few weeks. Upon mating with the queen—in effect fulfilling their life duty—drones die immediately. Bees: complex, organized, productive and fascinating.